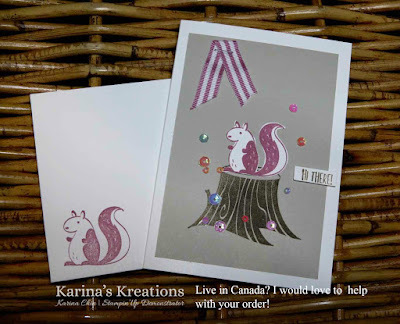 Karina's Kreations: Hedgehugs Note card! I love the Hedgehugs stamp set. The little critters in this set are so cute and are perfect for spring cards. If you need a quick card, grab a Whisper White note card and envelope. The bases are already cut, scored and ready to go. I cut a piece of 3 x 4-1/2" Sahara Sand card stock and stamped my tree stump with Soft Suede ink. 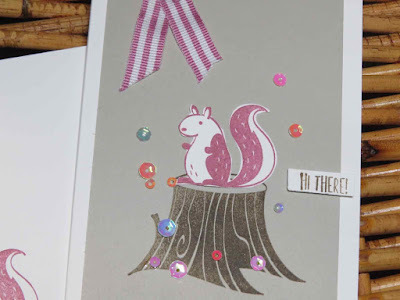 The squirrel is stamped with Sweet Sugarplum ink and cut out with scissors. I attached the Iridescent sequins with mono multi glue. If own Sweet Sugarplum, Dapper Denim, Flirty Flamingo, Peekaboo Peach and Emerald Envy, you may want to stock up on re-inkers and card stock. These colors will be retiring In June and are usually sold out by April 30. To place an order just click on one of the pictures below.